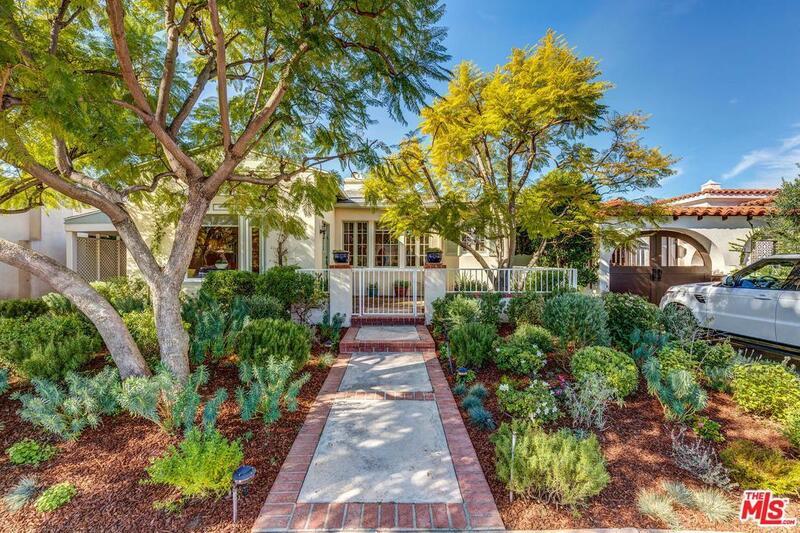 Newly priced classic in the desirable historic preservation area of South Carthay. As you pass the lush landscaping, you are then greeted with a beautiful bay window and large fireplace in the living room. The formal dining room hosts many and extends to the completely renovated kitchen with natural wood cabinets smartly designed for maximum storage, raised ceiling with skylight, stainless steel appliances with double ovens and cozy breakfast nook. Family room can easily be converted to a fourth bedroom and looks out to the back patio and English garden with fountain, blooming flowers and a secluded seating area surrounded by nature. Adjacent to the garage is a bonus room with half bath ideal for an office. Additional features of original hardwood floors, direct parking access, upgraded electrical/plumbing and many system upgrades, decorative moldings and recessed lighting. Located on a quiet street near Beverly Hills, The Grove, Museum Row, Freeways and upcoming Metro Purple Line.